With funeral costs rising at a disproportionate rate compared to other industries, we have taken a tough stance to assist both funeral directors and families together. Each year, the NFFD look to the industry and, in particular, our members for inspiration and to understand more about how families in the UK need their funeral directors to conduct themselves. With all the harping on about tried and tested funeral directors, it never ceases to amaze me just how many new, fresh and forward-thinking funeral directors are joining the industry. Some will say that there are by far and away too many funeral directors already – a notion that we completely disagree with – as there is about to be a new breed of funeral director nationally and these are ones to be celebrated and championed and the NFFD do that best – these new funeral directors will happily co-exist with our existing membership base. This year, we have seen our membership grow considerably due to recommendation from our members to other funeral directors and thank each and every one of them for their continued support. The NFFD was never designed to show funeral directors how to conduct funerals; we are a necessary aide for those in need of real business support, advice and assistance. Between us, the NFFD and our members are making a real difference in forcing through price awareness and cost-transparency. So much so in fact that both the NAFD and SAIF are, finally, talking about it too! With plenty of work still to be done to uncover the cloak-and-dagger older industry, this year’s NFFD member of the year is awarded to Paul Kane of Kane Funeral Services, Burnage near Manchester. Paul is an Ex-Army Captain of 18 years and has used his experience and expertise to build up an empire of 10 funeral homes over the last 6 years – and he’s showing no sign of stopping – With repatriation services, satellite support networks and national funeral arranging coverage, Paul has shown that doing things well does not mean they have to be unaffordable. Offering low-cost/High Quality services personifies everything that the NFFD stands for and having Paul as our member of the year will act as a constant reminder to the rest of the industry that families should come first. 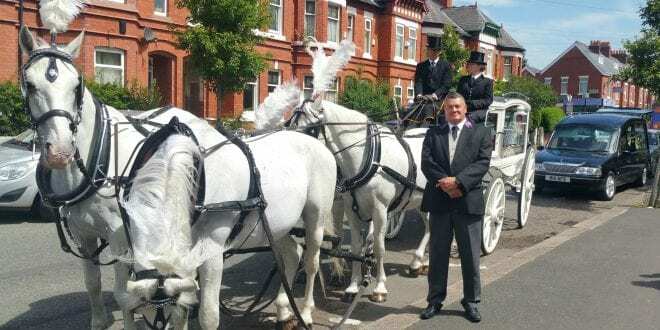 In addition to his own funeral business, Paul has begun to franchise across the UK in order to ensure that families get the same service, regardless of location and, in recognition of his status as NFFD Funeral Director of the Year, Paul is also being welcomed by the Gonetoosoon funeral homes opening in late 2106 and all throughout 2017 where he will support new funeral directors in the early months of their new business life. The first funeral home of its kind will open in Bolton this November. Best wishes to all for what remains of 2016 and a new, exciting start to 2017. Welcome to the home of the National Federation of Funeral Directors - the UK's only trade association dedicated to funeral directors, bereaved families... and the FUTURE! Our site is divided in two sections, one for Funeral Directors to learn about our range of innovative tools and services, which are designed to help them increase their business, streamline working practices, and minimise overheads... all with the aim of providing a more affordable service for families without impacting on the standard and quality of the services. The Consumer section of the site offers practical advice on how to arrange a quality funeral without spending more than is absolutely necessary, how to pay for a funeral, and how to leave lasting fond memories to your loved ones. Please feel free to peruse our site at leisure - If you can't find what you're looking for, email info@nffd.co.uk. To keep up to date with developments at the NFFD, please take a look at our blog and follow us on twitter @TheNFFD and Like our page on Facebook. We're pleased and proud to be here when you need us most! Please Note: The NFFD (National Federation of Funeral Directors) is keen to advise Funeral Directors and consumers that we are in no way affiliated with the NAFD (National Association of Funeral Directors). Whilst there is great merit in NAFD membership for funeral directors, the NFFD operates entirely independently to the benefit of funeral directors and consumers in equal measures. Join the NFFD and receive fantastic member benefits. Use our website to find a funeral director or arrange a funeral. Pre-plan a funeral with NFFD-endorsed Safe Hands Funeral Plans. Find information on our revolutionary Fair Price Charter. Please join our online community on Twitter and Facebook. Leave a free online memorial to your loved ones via one of the world's largest memorial websites, Gone too Soon. Lilies Funeral Directors have found the NFFD a very supportive and proactive organisation. We are a new business and chose the NFFD because we feel they match our values as funeral directors very well. I am very proud to be a member of the NFFD and they offer great benefits and particularly I support the Fair Price Charter. The NFFD represents their members and their interests in a constructive way. Always very responsible, professional and obliging. Their willingness to invest effort to understand us and the challenges that we face in our business has been invaluable. The NFFD should be congratulated on their approach. Copyright © 2017, NFFD ltd.